It was reported that in winning the 100-mile Twenty Mule Team on February 22, 2014, Brandon Reed and BA Resolute set a new course record. While they did set a record over this particular course configuration, it is Jennifer Waitte and Al Baraaq who set and hold the original course record of 8:45 over the original Twenty Mule Team 100 trails in 2000, before the course was changed to the present trails. They also won Best Condition that year. Al Baraaq, by Berdo out of Abu Farwyn by Numizmat, held a record of 28 of 29 AERC starts, with 11 of 11 100-mile rides completed, and 9 Best Condition awards. In 1999, Waitte and Al Baraaq also won the 100-mile Twenty Mule Team (and Best Condition), the 2-day 100 Death Valley Encounter (and Best Condition), and in 2000 they won the Virginia City 100. When it comes to the world of sports, endurance is a trait that is necessary to achieve success, win awards, and have medals pinned to one’s chest. But there are many sports where the person is not really the one that must pass the endurance test – it is the creature logothey sit upon. Equestrian sports are actually lovely to the eyes. The mighty steed is stunning; the rider weaving and leading the creature through the maze of jumps is incredibly graceful; even when heading through the woods after that sly fox, the world of chivalry is once again born, along with the actual sport. Many think of the equestrian sports as ‘British’ sports; a human and animal riding in perfect symmetry, dressed and groomed well, looking as if the 1800s have been resurrected. For 26 years, the annual Twenty Mule Team endurance ride has drawn riders from around the country to the Mojave desert in Ridgecrest, California. One of the premiere 100-mile rides in the winter (there's also a 65 and a 35 mile ride), it was started by Jim and Jackie Bumgardner in 1989; Robert and Melissa Ribley took over the ride in 2007 and continue to manage it. Brandon Reed riding BA Resolute (aka Goliver) won this year's 100 mile ride in 8:51, by 8 minutes over Diane Stevens riding Banderaz LC. Brandon was first heavyweight, and BA Resolute also won Best Condition. 29 of 33 completed the 100. It's the second highest completion rate - 87% - in the history of the ride. 2013 saw 89% complete the 100. Finishing 16th was Gina Hall on Fire Mt Destiny in 15:32 - Destiny's 19th 100-mile completion. Elizabeth Funderburk and her gaited mare Eagle Eyes Miss Dixie, (known as Team Fixie, with a big fan club), and JayaMae Gregory, riding Foxfire's Little Britches, all finished their first 100 mile ride, coming in 23rd and 24th in 17:38. Katy Elliot riding Kodaakhrom finished with them in 22nd place. The 65 mile ride had 36 starters and 34 finishers. Zach Rabow and RTR Rimfire won the ride, High Vet Score and Best Condition. The 35 mile ride had 29 starters and 27 finishers. Justin Loewen was the winner. **This post originally stated Brandon Reed set a course record of 8:51 for the 100-mile ride. While he did set a new course record over the current trails, Jennifer Waitte and Al Baraaq hold the original record of 8:45, set in 2000. I have previously completed the Western States Trail Ride. When the quota of 210 participants has been reached, further entries will be placed on a waiting list. Ten additional entries in the Ride List are discretionary and are generally accorded to foreign riders. 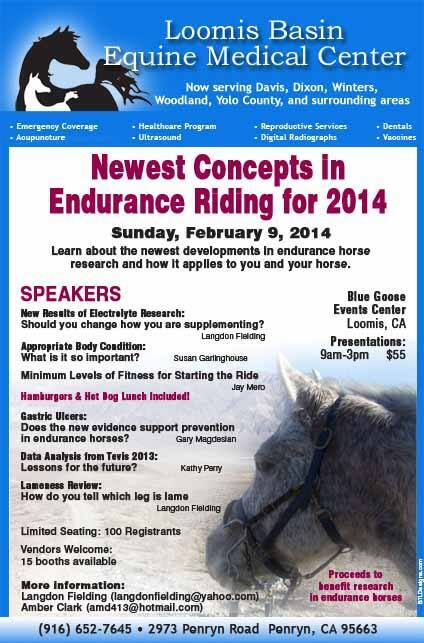 Annual Convention for American Endurance Ride Conference in March 2014 in Atlanta! Endurance riders from across the U.S. and Canada will converge on Atlanta, Georgia, for the American Endurance Ride Conference’s 2014 convention March 7 and 8 at the Sheraton Gateway Atlanta Airport Hotel. The convention combines free events – a trade show for distanced riders, early morning “hot topics” discussions, and an always-popular tack swap – with seminars ($55 per day), a dance on Friday night, and the nonprofit organization’s national awards banquet on Saturday evening. The trade show and tack swap are open from 8:00 a.m. to 6:00 p.m. on Friday, March 7, and until 5:00 p.m. on Saturday, March 8. The American Endurance Ride Conference announced the launch of its very own YouTube Channel. Written and narrated by Susan Garlinghouse DVM and produced by Ken and Julie Herrera, the first four videos produced feature educational instructions on how to vet your horse at a vet check, how to pack a crew bag, and how to camp safely with your horse. While aimed at "newbies" in the sport, even seasoned riders will find useful tips in the videos. Further education videos are nearing completion, and more are planned, including some by “Roving Reporter” Ken Herrera at the upcoming national convention, filming quick looks and goings-on at ongoing activities, vendors, parties and award banquets. "They're another great tool to demonstrate who we are," Garlinghouse said. There are a couple of changes planned for this year's ride. The ride committee has decided to raise the entry fee to $400, which now includes the Friday night dinner for riders as well as the Sunday Awards Banquet. The change in the entry fee is also necessary because of the increased costs of all aspects of the ride--not just the trail maintenance caused by the 2013 fire. The veterinary committee is planning to implement a couple of new proposals this year. One of the proposals is to give your horse a body condition score during the veterinary check in at Robie Park . Experienced Tevis riders know that a horse that is too thin or too heavy has less of a chance to finish in good condition. Therefore, look for an article from head veterinarian Greg Fellers on how to judge and score your horse's conditioning, which should help you moderate your horse's weight long before the event. Our record-breaking drought has the ride committee identifying many locations along the trail to add water troughs where natural water would be found in a normal year. The message on the social media sites this year is clearly about horse welfare and having opportunities for your horse to hydrate is the number one concern of the Tevis ride committee. Steve Hallmark and the trail committee are making plans and working with the USFS to restore the canyon trail from Last Chance to Devils Thumb which incurred major damage last summer from the fire. The Devil's Thumb side has had most of its work done in October and November but the east side of the canyon is scheduled for early spring. Please note the joint trail committees have a website for volunteers to sign up to help restore the Last Chance trail and the side hill bridge on the east side near the bottom. Please volunteer if possible for one or more of the work days. This is a chance to improve this canyon trail and make it safer. This section of WS Trail is scheduled to be opened by April 1st but check the websites to be sure. The 2014 Tevis is continuing to offer the legacy buckle program for first time finishers. This is a very popular program that continues because of the generosity of the donors. The Signature Rider entry is back, which is an all inclusive entry. While offering no competitive advantage, it allows riders to donate back to the ride and fund maintenance work and improvements to the trail. The first ten juniors to enter with a qualified sponsor will have their entry fee paid on their behalf. Thank you, Easycare, for your continuing dedication to the next generation of distance riders and making this junior program possible. For details on these programs please see the website and read through the pages of the entry for all the details. On behalf of the Board of Governors of the Western States Trail Ride happy training. Juniors Ride Free! EasyCare will pay ride entry fee for first ten juniors* to sign up for Tevis 2014! *Junior entry must be accompanied by paid adult sponsor entry to qualify for EasyCare paid entry fee. Under 18 years of age are considered "junior" riders. Go to Teviscup.org for entry forms and more information. Complete information about the convention can be found on AERC’s website: www.aerc.org/2014convention.pdf. The theme for this year’s gathering is “Horses First,” which reflects AERC’s commitment to horse welfare. “With rides of up to 100 miles in one day, it is imperative that our riders always put their horses first,” said AERC Executive Director Kathleen Henkel. “Every competition includes a pre-ride check for the horse, with multiple checks during and after the competition.” Endurance riders today, Henkel emphasized, strive to do well with their horses over the long run. “One of our most coveted awards is the Decade Team award, which honors riders and equines who have competed together for 10 or more years,” she said. Many rides offer introductory, fun rides of 10 to 15 miles, to acquaint new distance riders with veterinary checks and following ribbons along the marked course of a ride. The organization is also expanding the number of clinics so new riders become familiar with training methods, suggested tack, and common feeding protocols. The American Endurance Ride Conference motto is “To finish is to win,” and last year AERC’s 5,000 members completed more than 650,000 miles of competitions in rides across the U.S. and Canada. The national governing body for endurance riding in the U.S., AERC was founded in 1972 and has grown over the years as both a membership organization that tracks points and mileage for its rides of 25 to 100 miles per day, and as a leading force behind preservation and construction of new equestrian trails. Is endurance riding for cowboys wanting to ride over hill and dale? For dressage riders wanting to take their skills out of the arena? Or for trail riders who feel their outings are never long enough? Endurance riding is all that, and more. Most people with a reasonably conditioned horse or mule will be able to complete what the American Endurance Ride Conference calls a “limited distance” ride of 25 miles, and by AERC rules, they have six hours to complete that ride. At local endurance rides, you’ll find everyone from high-level competitors to families with multiple kids making their way through marked trails on their way to the finish and their award – it’s written into the rules that all finishers must receive an award of some kind. But no wild riding is involved as the rides are overseen by veterinarians, known as control judges, who check over the equine athletes before, during and after the ride to be sure each one is “fit to continue” as they make their way along the course. Hundreds of endurance rides are held annually around the U.S. and Canada, with everything from small, low-key rides to ultra-competitive races. The organization’s national office, headquartered in the self-proclaimed “Endurance Capital of the World” in Auburn, California, tracks miles and points for all members and their horses, and confers annual awards in both regional and national competitions, including a family award and an award given to the rider 65 or older who completes the most miles each year. I had purchased my horse, Caartouche CS (Rio), in November 2005 (see previous post) and he was shipped to me from Colorado to Bishop, CA about a month later. Shipping was delayed because of snow storms. I had decided to not have him castrated right away. I thought I would ride and compete in endurance with him for a year and then decide if I should have him cut or not. It took some convincing of the owner of where I board my horse to allow me to have a stallion at her place. I had only met her once, and she knew I was green. She did have a place for him though and said that she would give it a try. It is more challenging to own a stallion because in most cases you have to keep them separate to the point where their paddock is not next to any other horses. Nouvelle Research, Inc., the manufacturer of the Cur-OST® line of supplements for horses announces the addition of Beverly Gray to our Team! Beverly's race career spans over 2 decades with over 19.,500 competition miles, 370 races and 110 wins. Her list of accomplishments is extensive including her selection with Regalidon (aka Paladin) to the United States Equestrian Endurance Team. Beverly and Pal are an awesome team and were the first USA rider at the 2002 World Equestrian Games in Jerez, Spain. The next year, they were invited by His Highness Sheikh Mansoor Bin Zaued Al Nahyan to race at his beautiful al Wathba Endurance Village in Abu Dhabi. The following month, Beverly and Pal were invited by the United Arab Emirates Racing Federation to race in Dubai. Sheikh Mohammed bin Rashid Al Maktoum was her gracious host. She has also raced 3 times in Malaysia by invitation of the King of Malaysia. Her highest career achievements is the National Champion BEST CONDITION horse award riding Jolly Sickle. One of Beverly's most famous horses is an Anglo Arabian named AA Omner. He raced 9,000 of Beverly's 19.500 career miles. He was inducted to the American Endurance Ride Conference Hall of Fame, Top Ten Endurance Horse of the Millenium by Arabian Horse and a Breyer model horse. Nouvelle Research, Inc.is about protecting and rebuilding total health for horses, pets and people. Beverly is the prime example of what we as a company represent; health, stamina and recovery. We congratulate Beverly on her achievements and welcome her aboard our team as it is truly an honor! For more information regarding Nouvelle Research, Inc. and the Cur-OST® line of all natural curcumin based anti-inflammatory formulas for horse, pets and people, please visit us at www.curost.com or call 1-800-476-4702. For more information regarding Beverly Gray and her list of accomplishments, please visit www.bevgrayusa.com. Camptown Races - Endurance.net's Book of the Week! 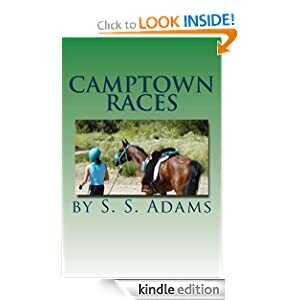 Sandra Adams' book Camptown Races is Endurance.net's book of the week. Sandra Adams was born in California, and grew up in Anaheim, not far from Disneyland - and several good stables. As a child, she could not find enough horses to ride - belonging to other people of course. While working on her degree in Exercise Physiology, she acquired a smallish, not so handsome horse named Porsche, with dozens to follow over the span of nearly 40 years. She and her mounts have won Regional and national recognition and awards in Western, Hunters, and endurance, with commendable success in an ongoing role in MSAR - Mounted Search And Rescue. She married retired UCLA Baseball Head Coach and author Gary Adams in 1984 and two daughters, Jessica and Audrey followed. This is the first published work from this author with more to come. We're happy to welcome these vendors at the 2014 AERC "Horses First" Atlanta convention -- AgSouth, Auburn Laboratories, Distance Depot, Evolutionary Hoof Care, Reactor Panel Saddles, Renegade Hoof Boots, Revitavet, Saddle Up LLC, SERA, Taylored Tack, Ultimate Bitless Bridle, United Country Real Estate, USEF. Know someone who might be interested in a booth at convention (yourself, maybe)? Here is a link to the 2014 Trade Show Packet. 6ARC_Logo_A21February 3, 2014, Carmel, California, USA ~ The Arabian Racing Cup is pleased to announce the nominees for 27th annual Darley Awards, sponsored by HH Sheikh Mansoor Bin Zayed Al Nahyan Global Arabian Flat Racing Festival. Honoring the best in the US in Arabian flat racing in 2013, the US champions will be named at the Her Highness Sheikha Fatima Bint Mubarak Darley Awards Hollywood 2014 celebration to be held at the Dolby Theatre in Hollywood, California on the evening of April 4, 2014. Robert Clovis "Dr. Bob" Goulding, 1922 – 2014, was a beloved husband and father. He shared a love of horses and that of being a cowboy. Bob died January 13 in Auburn, peacefully and with his family close by, at the age of 91 years old. He was preceded in death by his parents, Harry and Marjorie Goulding, and granddaughter Cynthia Brush. Bob was born and raised in Sacramento. He graduated from McClatchy High School and earned his veterinary degree from Washington State University. Bob owned a private vet practice and then held a long career with the State of California in the Bureau of Animal Health's Horse Program. He owned a cattle ranch in Modoc County, California, where he lived the frontier life with spring water, periodic electricity from a gas-powered generator, and a CB radio for communicating with his daughter 20 miles away. After retiring from the State of California he remained active as a judge and advisor for American Endurance Ride Association and the North American Trail Ride Conference. He was a head judge for the Tevis Cup in the 1960's. Bob was one of the original Pony Express riders for the Centennial Pony Express Re-ride, riding from Phillips Station to Strawberry Station in the Sierra Nevada Mountains on what is now Highway 50. He also served as Wagonmaster for the Kit Carson Mountain Men Annual Wagon Train from South Lake Tahoe to Placerville. Bob was active in such organizations as Kit Carson Mountain Men, Native Sons of the Golden West, Masons, Shriners, and St. Peter's Anglican Church. Bob is survived by his wife Charlotte of 63 years; children Cathy Baldwin, Candy Phillips, Claudia Brush, Curt Goulding, and Carolyn Goulding; sister Harriet Lawrie; 2 nieces, 6 grandchildren, and 6 great-grandchildren. Donations can be made to: VEF Cynthia Brush Memorial Scholarships, c/o Ken and Claudia Brush, 19724 Dixie River Road, Caldwell, ID 83607, or to your local 4-H club. Come celebrate his life with us at Auburn Dewitt Senior Center (Avenue D entrance) on February 8 at 1PM.